In the summer, you need to prepare not only sleds, as in the old adage. It is necessary to take care in advance of other attributes that save us from the winter cold. This period is best suited for changing radiators. But before you change them, you need to decide on their appearance and type. To make your choice easier, we have classified the main types of radiators and indicated their main characteristics, advantages and disadvantages. 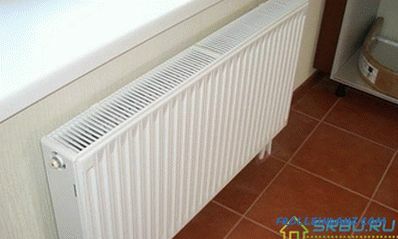 Such radiators are also called convectors, they have high efficiency - up to 75%. Inside the radiators there is one or more steel heating panels and convector fins. The device is a steel panel radiator. Panel radiators are the most cost-effective solution for your own home and are therefore the most common in autonomous heating systems. 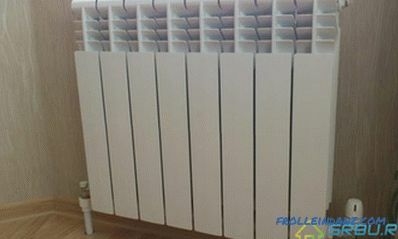 Depending on the number of heating panels and convection fins, the following types of water heating radiators of the panel construction are distinguished: 10, 11, 20, 21, 22, 30, 33. Manufacturers : These are mainly European countries - Germany (Buderus and Kermi), Czech Republic (Korado), Italy (DeLonghi), Finland (PURMO). Their prices are not high, so Russian manufacturers are not very well represented in this market. Inertia is low, the heat return is excellent. The volume of coolant is small, the energy consumption is small. 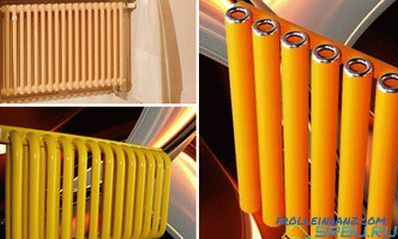 These radiators are environmentally friendly and harmless, so they can be used in hospitals, schools and kindergartens. If water is drained from the heating system, then when the oxygen comes in contact with the walls of the radiator, corrosion begins to form . Water hammers are dangerous for steel radiators. Therefore, in high-rise buildings they can not be used. Due to convection, drafts and raising of fine dust are possible. 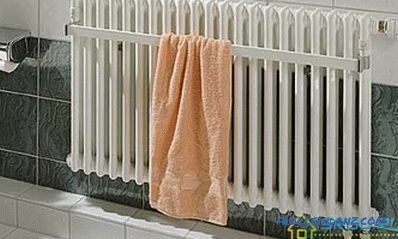 The design of the radiator is a construction of steel pipes through which hot water flows. The production of such devices is more expensive than the panel, so their price is higher. There are many design options - this is a real feast for the designer's imagination. Of the European manufacturing countries can be called Germany (Kermi, Charleston, Zehnder Charleston, Arbonia) and Italy (Israp Tesi). Domestic devices manufactured by KZTO (Kimry) differ in operating pressure up to 15 bar. A model "PC" and "Harmony" is also protected from corrosion by a polymer coating. Pros and cons: These radiators, like the panel ones, have advantages and disadvantages inherent in steel products. However, in terms of pressure, their indicators are better (this is a plus), and their price is significantly higher (this is a minus). 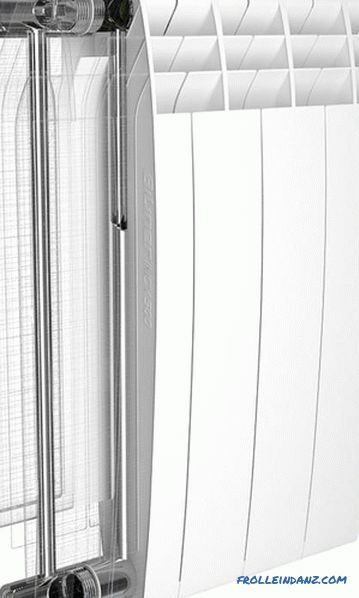 Pressure (operating) - 6-10 bar on average (for panel radiators) and 8-15 bar (for tubular radiators) . Thermal power (total) - 1200-1600 watts. Hot water temperature (maximum) - 110-120 degrees. The pH of the water is 8.3-9.5. As the name suggests, these are radiators made entirely of aluminum. 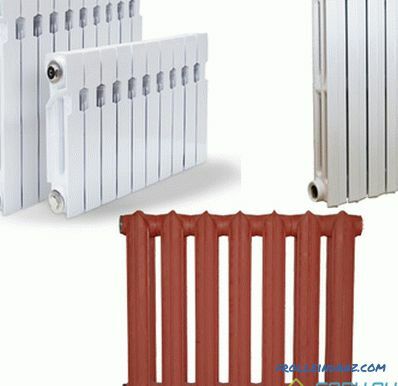 Here there are two types of radiators - cast and extrusion. It is better to use both of them for autonomous heating - they are not suitable for a centralized system due to pressure and corrosion, which is caused by low-quality coolant in the central heating network. Injection molded radiators feature wide channels for hot water and strong thick walls. The radiator is made up of several sections, which, if necessary, can either be added or removed. With this production method (cheaper), the vertical parts of the battery are extruded from the aluminum alloy on the extruder. The collector is cast from silumin. The whole product cannot be changed - you can neither add sections, nor remove them. This is the main disadvantage of this type of radiator. Manufacturers: These are mainly Italian companies. In particular, we can call FARAL Green HP, ALUWORK, Sira Group (ROVALL batteries), Fondital. These radiators are very light, so they are simply mounted without requiring the use of durable brackets. In terms of heat transfer, they occupy one of the first places among all heating appliances. They can heat a room very quickly. 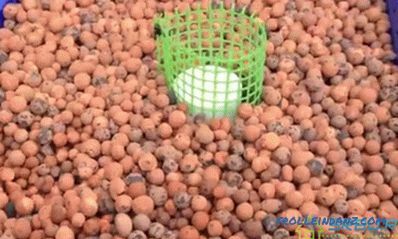 They are economical and can be equipped with a temperature regulator. The design of products is modern and attractive. The service life is not very long - about 15 years. Aluminum is chemically active, therefore it suffers from corrosion and requires a high-quality heat carrier. Hydrogen is produced when air is displaced. Aluminum radiators are not able to withstand hydraulic impacts and pressure surges. Pressure (operating) - 6-16 bar on average. Thermal power (1 section) - 82-212 watts. Hot water temperature (maximum) - 110 degrees. The pH of the water is 7-8. They can be conventionally divided into conventional or modern-style radiators and retro-style radiators. The oldest type of radiators. These radiators are distinguished by simplicity and rigor of forms, a flat facade, neat design. They are heated for a long time, but all the adversities of the central heating stand with honor. They are durable, cheap, serve 50 years. 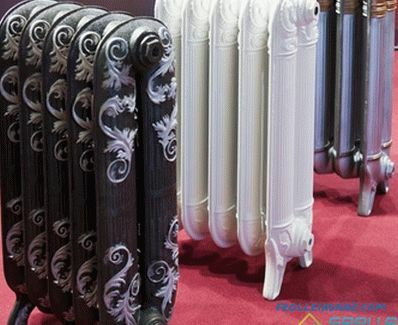 Therefore, deciding which types of radiators to choose, many stop on cast iron ones. 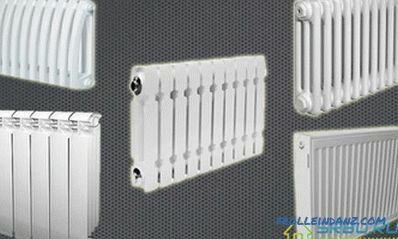 Manufacturers: Budget, cast-iron radiators are produced by Ukrainian, Russian, Belarusian factories. But foreign products and quality will be better, and look prettier. Note the company Konner, Viadrus, DemirDöküm, Roca. Each of these radiators is a small masterpiece. After all, cast iron art casting looks very elegant, decorating with itself any room. Unfortunately, each such battery is very expensive. Manufacturers: These are firms from England, Germany, France, Turkey, China. 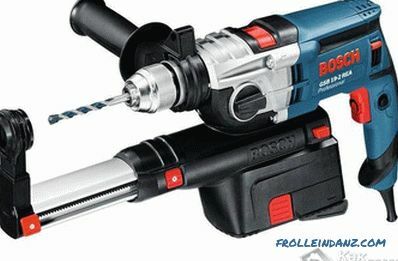 For example, the companies Roca and Konner produce very beautiful models. They can work for at least 50 years. Cast iron is chemically passive, so it is “too tough” to corrode. Radiation heats well a room with high ceilings. When the heating is turned off, the batteries stay hot for a long time. Low price (except for models made by art casting). A lot of weight and dimensions make it difficult to transport and install. Radiators need a strong mount. Cast iron is a brittle metal. Water hammer is able to break the iron battery. Pressure (operating) - 9-12 bar. Thermal power (1 section) - 100-160 watts. Such radiators combine a tubular core of steel and an aluminum shell. Basically they are made of sections, even numbers. But there are also solid (monolithic) models (rarely available), plus the ability to withstand up to 100 atmospheres of pressure. In the case of monolithic models, a strong steel frame is created on which the aluminum sheath is “worn”. The device is a bimetallic radiator. Fully bimetallic radiators have a steel tubular core all over the radiator channels. They are reliable and durable, but they are expensive. 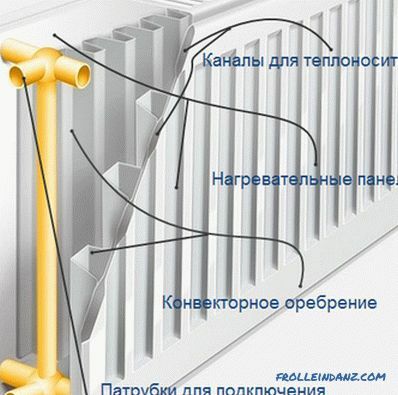 Good radiators are made by Rifar (Russia), Royal Thermo BiLiner and Global Style (Italy). Pseudobimetallic names are radiators that have only steel reinforced vertical channels. They are cheaper than the previous ones, by 20 percent, they give off heat better, but they are more sensitive to corrosion due to the contact of the coolant with aluminum. 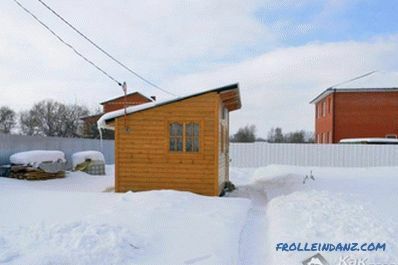 Such products make the company Rifar (Russia), Sira (Italy) and Gordi (China). The inertia is almost absent, the heat return is great. Bimetal can withstand hypertension and water hammer. The volume of hot water is small. The installation is simple, the design is modern. Heat output is lower than that of aluminum radiators. Pressure (operating) - 20-50 bar on average. Thermal power (1 section) - 150-180 watts. Hot water temperature (maximum) - 130 degrees. Heat carrier characteristics - it does not matter. 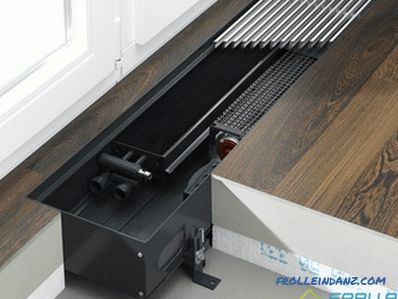 A new solution among heating devices is convectors hidden in the floor, consisting of a heat exchanger, a box and a decorative grid. They have copper pipes for heat carrier and aluminum fins. There are models with a steel tubular core ("Breeze" from KZTO). Particularly good interior radiators with panoramic windows. They are used at airports, car dealerships, sports facilities (for example, swimming pools). 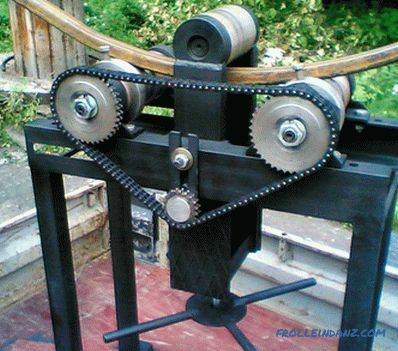 Strength and simplicity of construction, low weight. The uniform heating of the room. Inability to use forced ventilation. Manufacturers: OPLFLEX (Czech Republic), Mohlenhoff (Germany), JAGA (Belgium), IMP KLIMA (Slovenia), CWTO (Russia). Pressure (operating) - 10-16 bar. Thermal power - 130-10000 watts. Hot water temperature (maximum) - 110-130 degrees. These convectors, also called warm baseboards, are very low. Only 20 or 25 cm. And their depth is even less - 10 cm. They haven’t really settled down with us yet, and in America they are very popular. They are mounted on the wall. Fuel economy for heating is up to 40 percent. The presence of thermostats, protection against overheating. 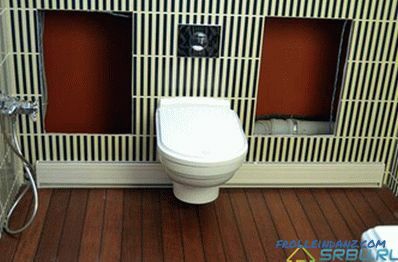 Installation should be done only by specialists. Due to the fit of the convector to the walls, their decoration is jarred. Thermal power - 500-1500 watts. Coolant temperature - up to 130 degrees. Maximum working pressure up to 16 atm. Now, having learned about the types and benefits of different types of radiators, you can choose the right radiators more confidently and correctly.